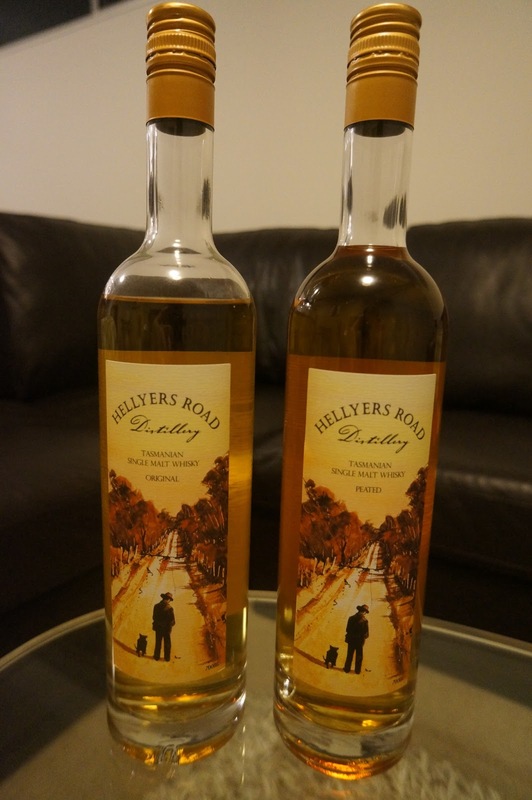 Hellyers Road Distillery, based in Tasmania, Australia, bill themselves as "Australia's largest distiller of Australian single malt whisky". Part of a growing and highly praised Australian whisky industry, Hellyers Road (like a lot of other Tasmanian distilleries) produce a number of whiskies, liquers and even vodka. It's the whisky we're here to taste today though - specifically the "Original" and "Peated" varieties. I've always found Australian whiskies to have a unique taste. It's hard to put my finger on, and it's not something I've ever noticed in whiskies from any other region (except NZ), but it's a sweet, distinctive taste which (to me at least) instantly identifies an Aussie whisky. Coconut perhaps? Anyway, to me Hellyers Rd has that taste in spades (not dissimilar to the standard offerings from other Australian distilleries like Lark and Sullivans Cove). The ABV content feels spot on - not overpowering, but not underwhelming either. A nicely balanced, easy-drinking whisky. If you've never tried Australian whisky before (and I suggest you do! ), it would be an excellent place to start. The Peated variety, on the other hand, has none of the standard "Australian" taste mentioned above. It's almost like they've taken out that taste (whatever it is), and replaced it with smoke/peat. Not to an overpowering extent, but peat is definitely the dominant characteristic. If you're a fan of Islay whiskies (which I very much am), you'll probably really enjoy this. It's the right balance of flavour, smoke, and it's great to see an Aussie distillery mixing it up a bit. Welcome to "Time for Whisky"! "Time for Whisky" was born out of the love of sharing a dram, talking about a dram, laughing over a dram, and exploring different whisky styles, regions and stories. It'll cover what's on my shelf, what I've been trying in bars, whisky events, simple tasting thoughts, whisky news, and anything else whisky-related. What "Time for Whisky" won't cover is complex tasting notes that you can't follow or sound down-right absurd. You won't hear about a whisky that "reminds one of a Tuesday morning in Spring with an Easterly breeze blowing" or that "smells like two wet dogs playing in a park" (thanks to the hilarious James Buntin for that last one), but you might for example hear how I think the Glenfiddich AoD 19yo Madeira finish is a nicer, more complex and significantly cheaper dram than the Glenfiddich 21yo (itself an excellent drop). Not content to simply stock up on 1.125L bottles of Johnnie Red like the majority of travellers, I started exploring the world of Single Malt Scotch whiskies - first with Speyside/Highland options, then branching out into Islay, Japanese and even Australian whiskies. At last count I had 43 different bottles of whisky/whiskey, covering Scotland, Ireland, Japan, India, USA and of course Australia. I love nothing more than sharing a dram with my wife or mates, but figured - why not share them with a broader audience? Not literally of course, but through blogging. Any other interesting whisky or whiskey-related news that might interest you! Enjoy (and please let me know if you have any feedback)! Thanks for reading. Note: This blog is intended for those who are of legal drinking age in the country in which they reside (in Australia, 18 years and older). This blog exists only to give my personal opinions on all things whisky, and does not constitute legal advice, suggestion or otherwise. If you are not of legal drinking age, please do not read this blog. Thanks.